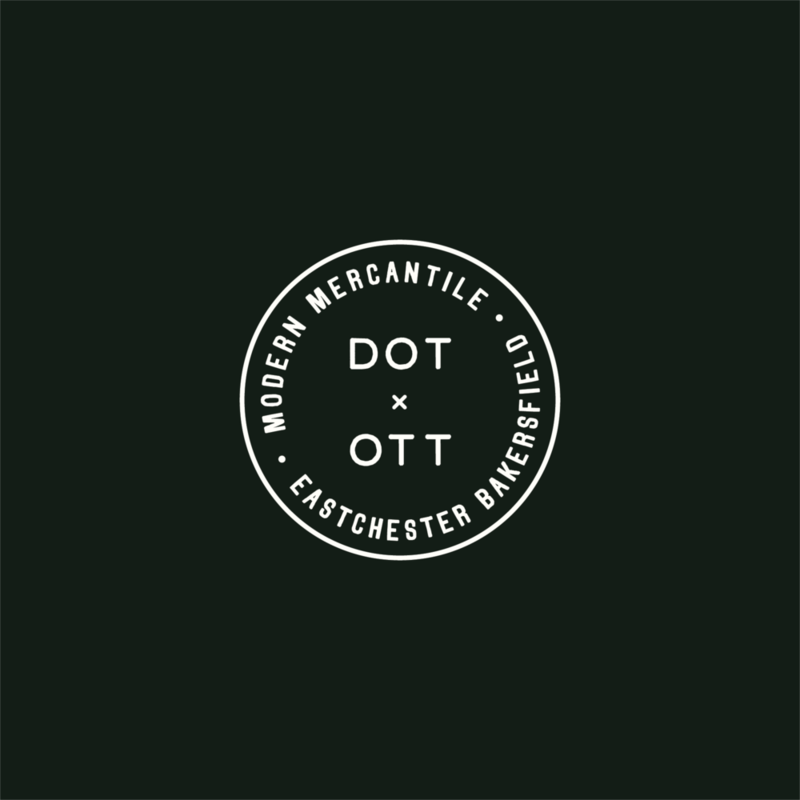 Dot x Ott is a new modern mercantile + purveyor of fresh provisions in Downtown Bakersfield, opening spring 2019. Taking up residency in a vintage brick building, Dot x Ott will serve our Eastchester + Downtown neighbors and will be the first business of its kind in the 18th Street corridor. Dot x Ott reached out to Purveyor House when they began the process of opening their shop. With a little less than a year til the doors would open, we hit the ground running as part of the creative team. Purveyor House led branding + marketing in collaboration with interior designer + creative visionary Jeran McConnel of Oleander + Palm. 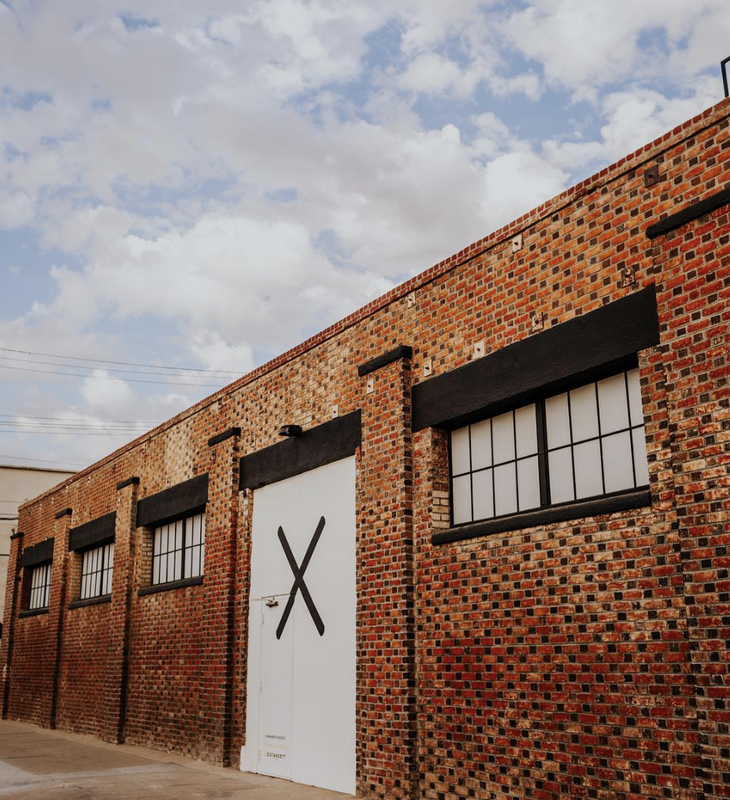 Dot x Ott is important to Bakersfield because it’s located in a new center of interest downtown—the newly dubbed Eastchester. Across from Cafe Smitten + 17th Place Townhomes, Dot x Ott will fill a huge need for a fresh grocery + eatery in this well-walked area. We used our connections to bring a sense of camaraderie + community, from focus groups with17th Place Townhomes residents to a seamless integration into Second Saturday. Our first order of business was to define the direction define the direction of this brand, vision + aesthetic. 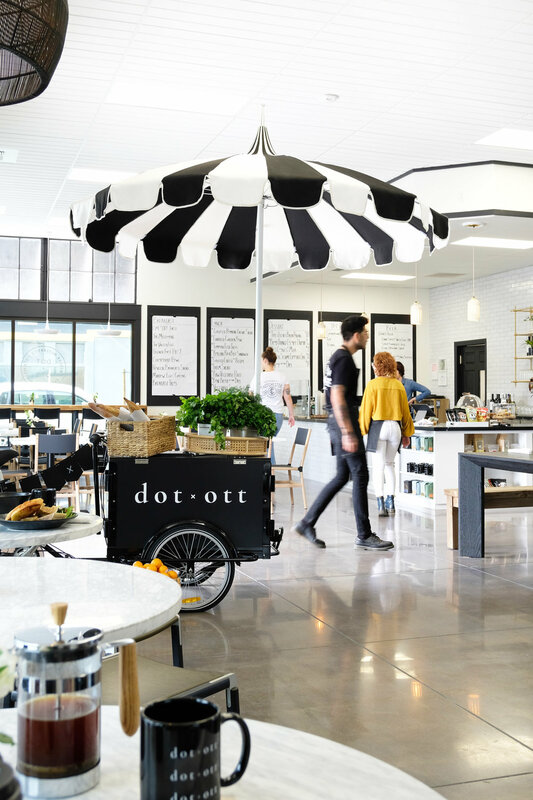 We took a discovery trip to Los Angeles, Napa Valley + San Francisco to understand the mindset, vision + intention our clients wanted to bring to life at Dot x Ott. During this trip, we gathered inspiration from packaging samples, product offering lists, logo design, spacial flow + overall creative direction that would set the tone for this new brand. 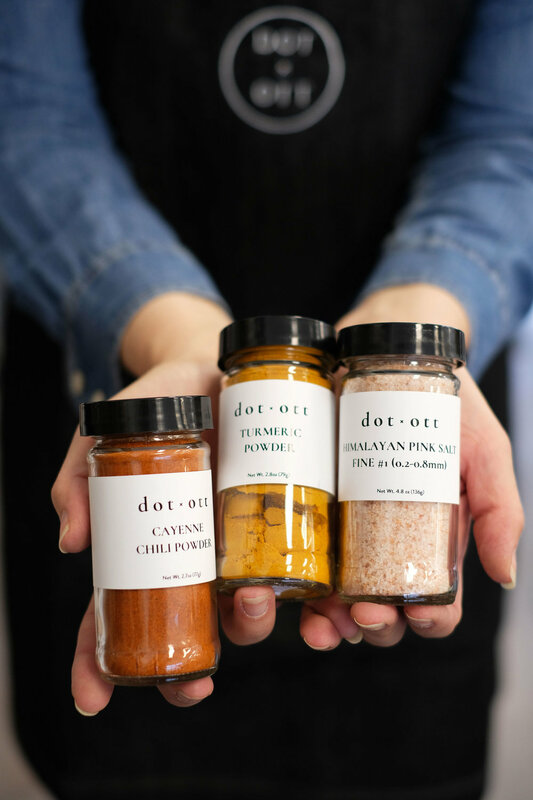 The owners brought the name Dot and Ott to the table as a nod to their childhood + we loved the nostalgia and ownability of the name from the get-go. We decided to use an “x” instead of “+” or “and” to bring a modern touch. The x would become part of the brand’s logo + creative suite. 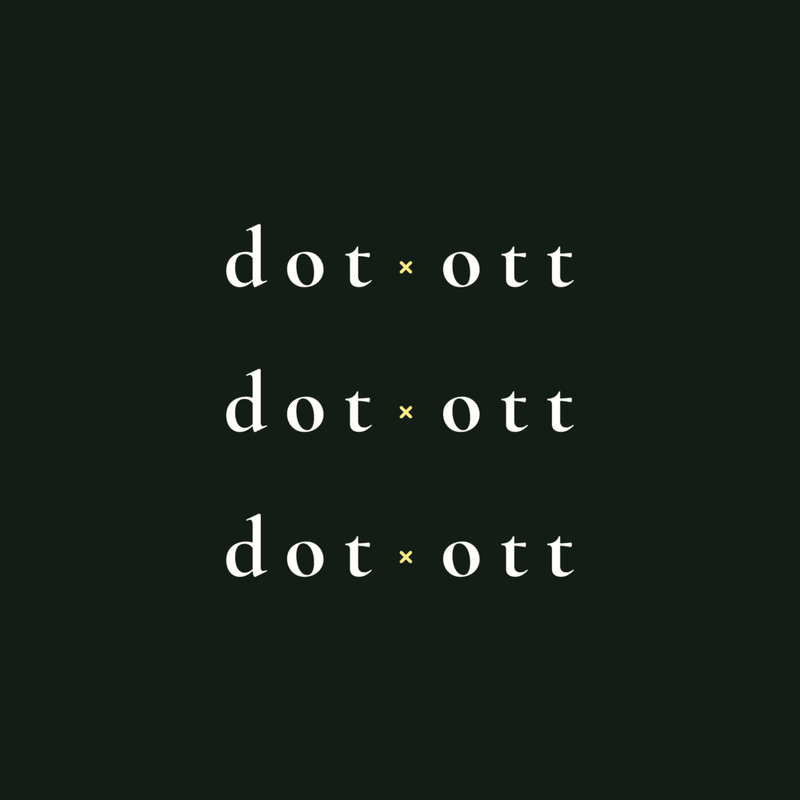 There will be branded items for sale at Dot x Ott when it opens, so we wanted to make the x synonymous with Dot x Ott. Piggybacking on this, our pre-launch marketing campaign was brought to life using a hashtag phrase “#xmarksthedot” + painting the perfect “insta-wall” on the side of the building. 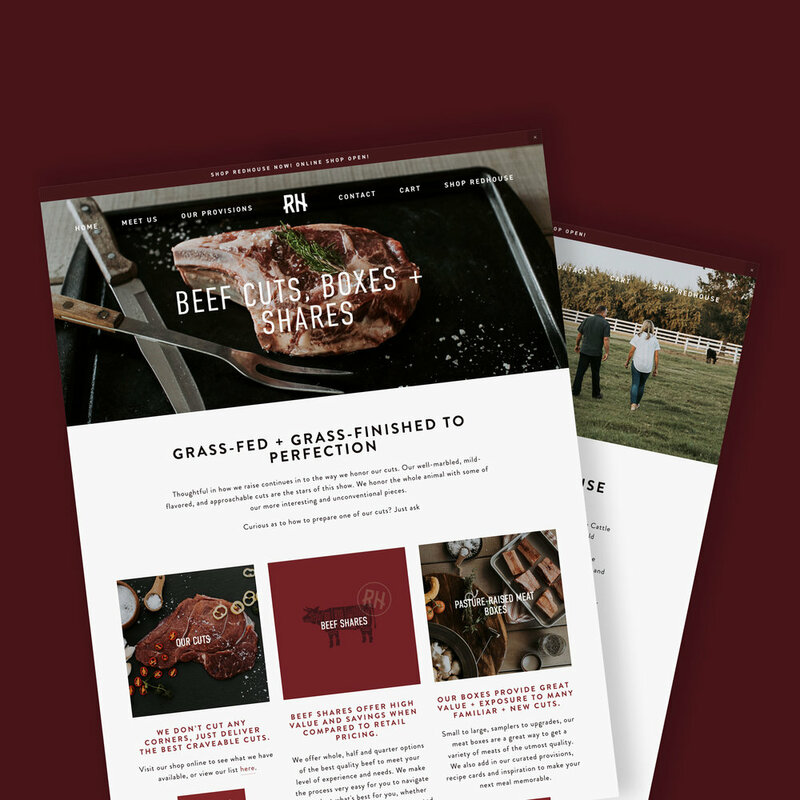 To help Dot x Ott reach opening goals, we created a custom marketing and brand development plan based on their brand strategy. 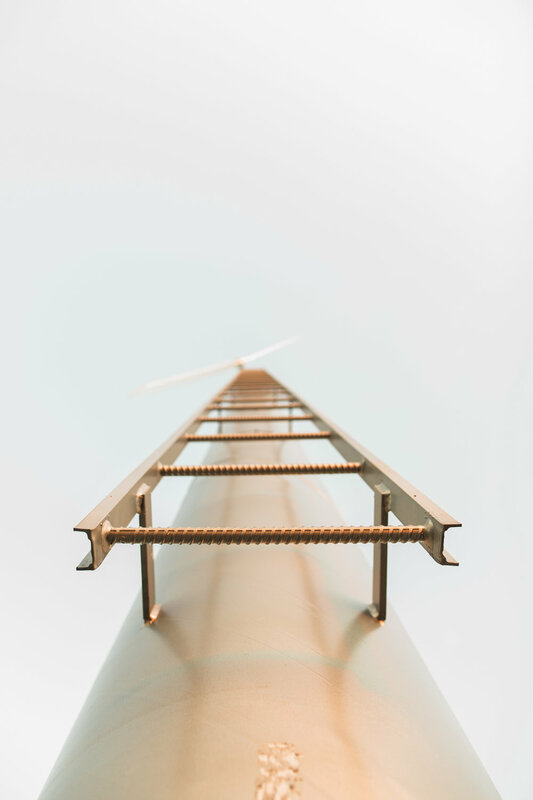 This marketing plan took stock of their current position and laid out the specific strategies, guardrails + activities to help them in their success. We launched their website + social media platforms, and we continue to manage the content as they ramp up for opening to ensure everyone knows what is going on behind the scenes. One of our first marketing pushes was a holiday gift box for Dot x Ott’s first showing at Bakersfield Second Saturday. 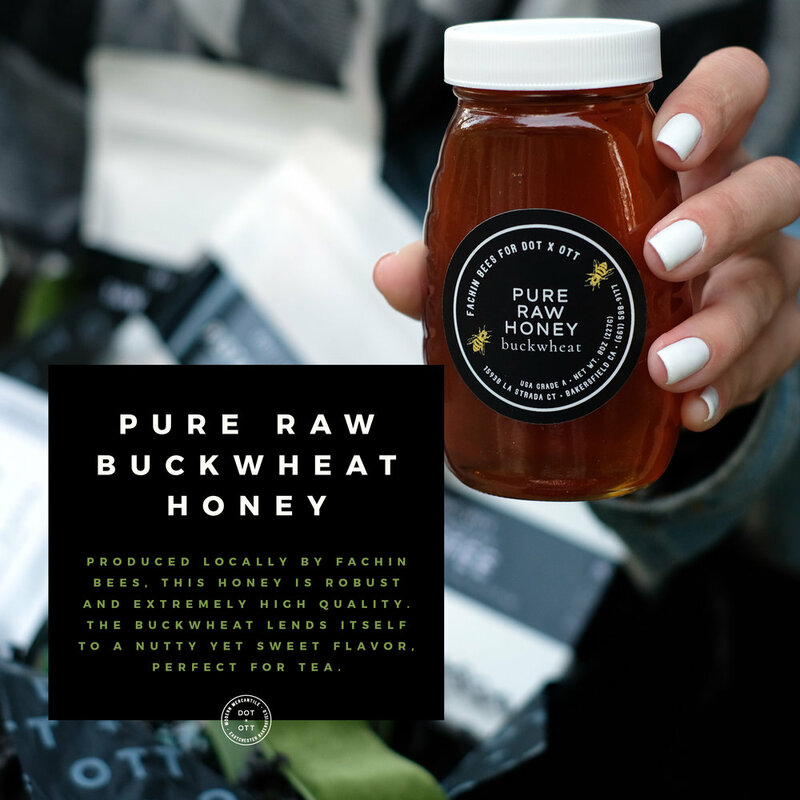 We produced custom graphics using photography by Oleander + Palm to spread the word, ordering and quickly selling out of over 300 boxes. As Dot x Ott opened, we helped share their story in a way to spark interest + bring people in to see what they’re all about. We put together a private preview for select members of the community to get a first glimpse before the soft open. From there, we’ve helped build their presence through a customized social media presence that helps invite conversation. We want our guests to feel welcomed even online. For the holiday box, we designed custom packaging that will be a yearly holiday “black label” aesthetic for Dot x Ott moving forward. This process informed the packaging we crafted to hold precious inventory for sale. Come opening, we will have designed custom to-go packaging, private label inventory, branded inventory, tissue paper, tape + stickers. For opening, we spent time to carefully craft items for maximum branding exposure. 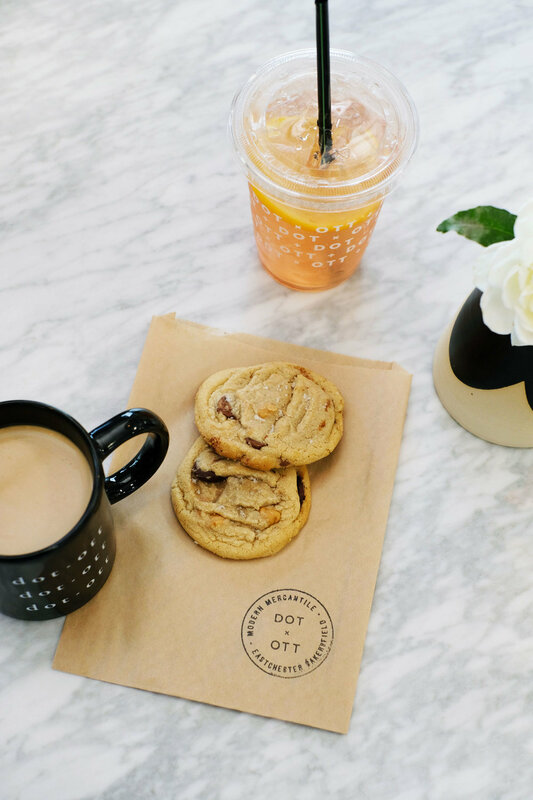 From the to-go cups, to the mugs to sip coffee while in store, the brand was there. Stickers featuring the badge are used to seal bread + to-go boxes. 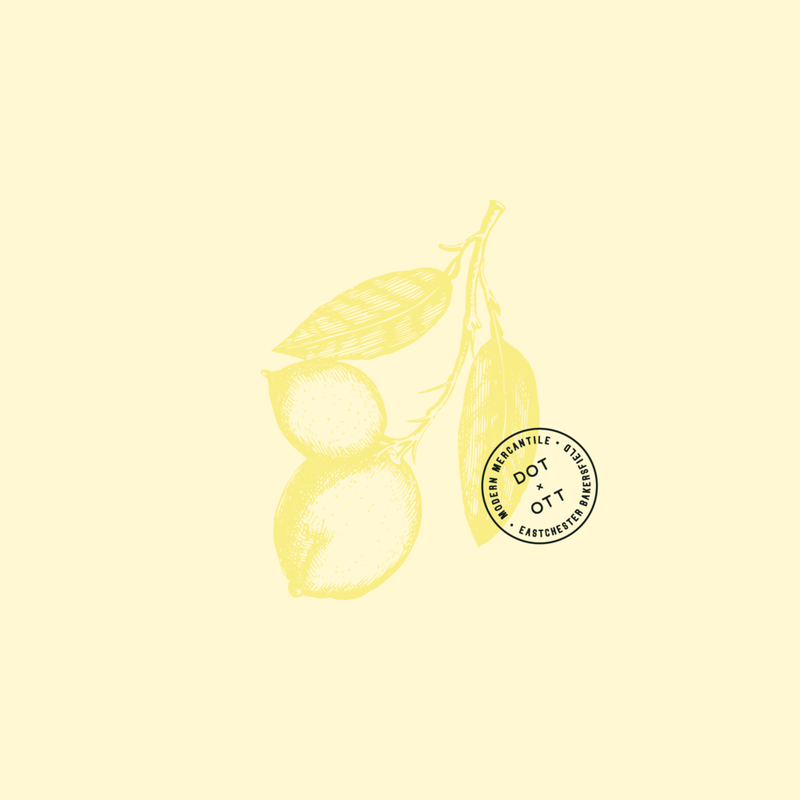 Our favorite part of the branding exercise for packaging was the system created for their raw good private labels. We created a system to help frequent buyers find the item they desire + in a way that is scalable for Dot x Ott. For the building’s exterior, we crafted custom signage and had parts repainted + refreshed to bring some modern elements. 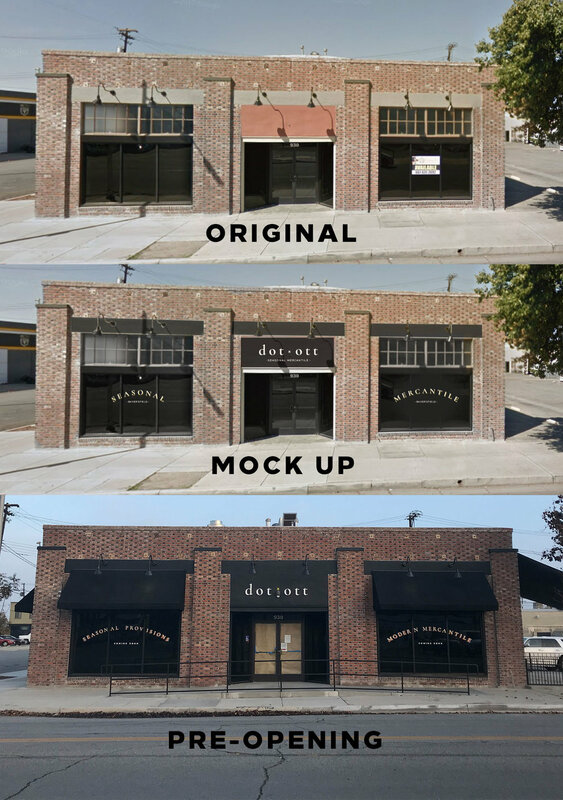 Pairing black paint with overhead signs + window decals displays different elements of the branding suite while still leaving a bit of mystery as Dot x Ott plans to open in a few short months [with much more to be revealed]! Dot x Ott is now open to high remarks! What was once just a name + a building now has a brand built on strategy, a unique aesthetic + a community minded point of view. Laurel Ag is focused on precision water solutions + agriculture products. They aim to revolutionize the industry through innovation and a customer-centric mindset to help farmers, investors + management companies reach their goals. 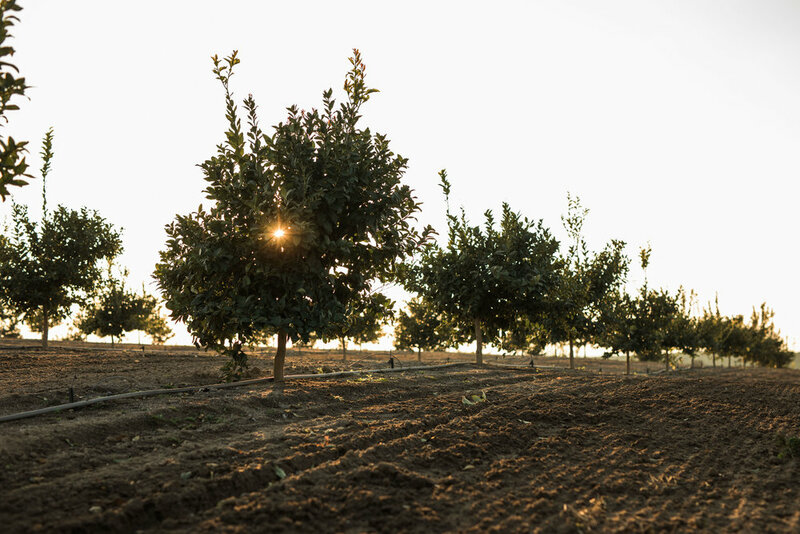 What once were separate efforts are now a combined group on the same long-term mission to provide growers with the right tools to do what they do best: cultivate the land in a sustainable, profitable + responsible way. 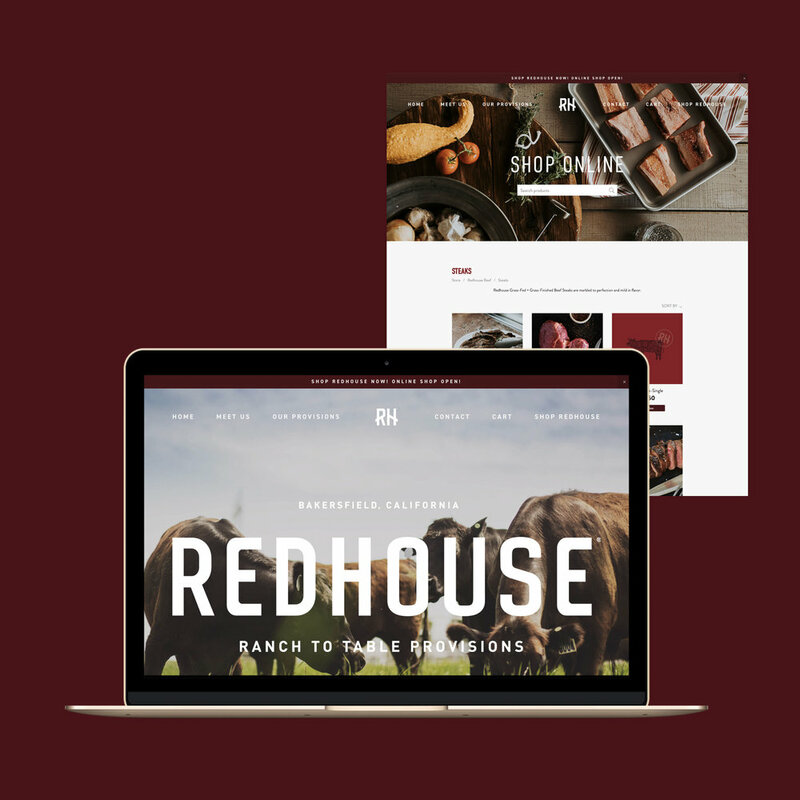 We set out to define their brand, name, look + feel with a new, comprehensive brand identity point of view, website splash page + brand communication plan. 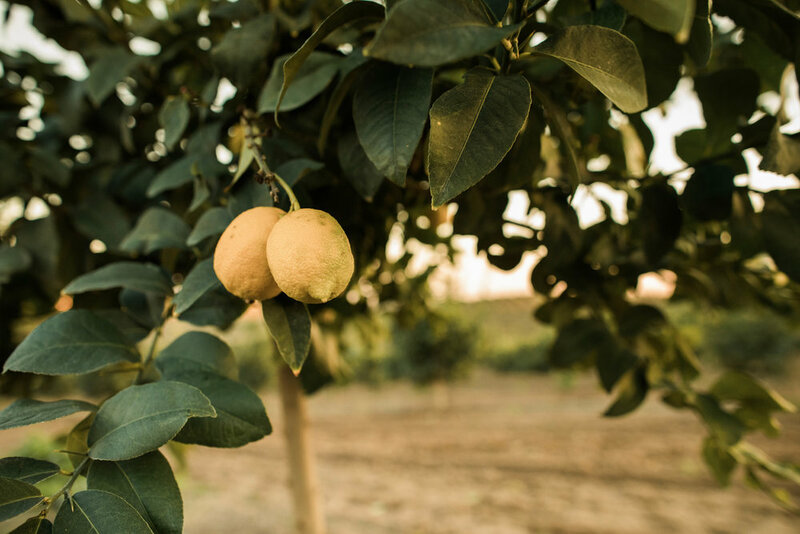 Laurel Ag is the culmination of Arable Capital Partners’ acquisition of several like-minded businesses located in the Central Valley of California. As with any acquisition, it is key to bring together the vision leaders and those involved within the businesses to set plans for the future + how the collaboration will run. We were brought in before acquisitions were finalized, and we worked with the team to identify just what was happening and what internal communication + buy-in would be required to build this new home for these businesses. To start, we needed to get to the core of why these businesses were attractive enough for Arable to acquire them. Was it their service? Their knowledge base? It was all that and so much more. From there, we set forth a plan to learn about each entity and build a brand that captured the essence, drive + innovation they all shared. As we started learning more about the individual businesses that would make up Laurel, something special rose to the surface—the desire to make each and every customer proud + profitable. We used this concept to hone in our brand name development. We wanted success, heritage and collaboration to be the key descriptors for this new operation and found that the word “Laurel” embodied that. It is a visual symbol of success historically used to crown victors. It has a simple + familial feel. Both the name and the corresponding symbol helped solidify the brand identity. 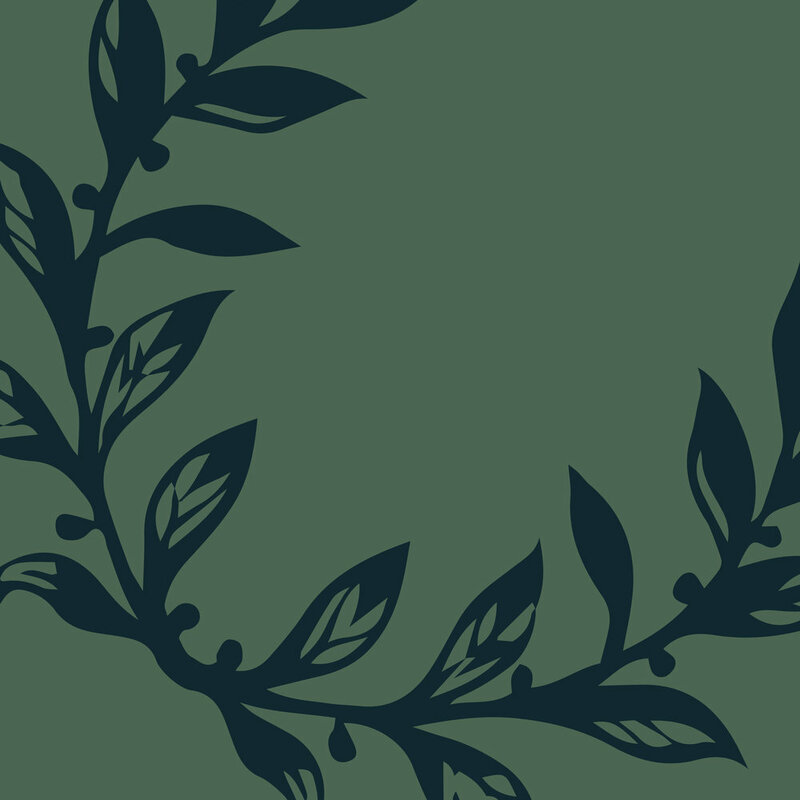 To help bring the laurel wreath idea home, we developed an aesthetic, color story + identity system to give Laurel an ownable brand + logo. 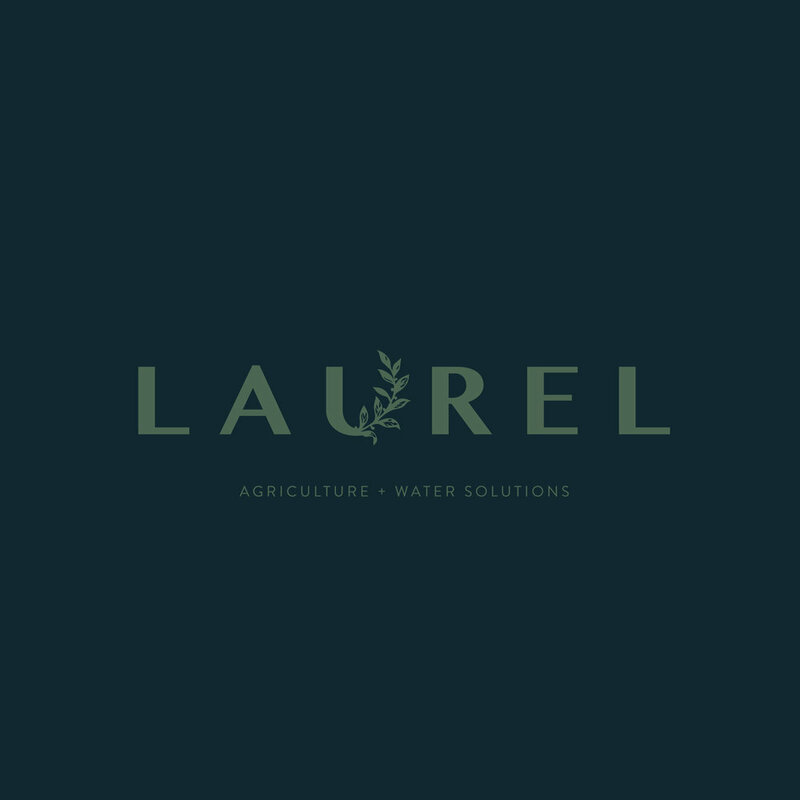 We chose greens with blue undertones to illustrate the service Laurel provides—water + agriculture solutions. Along with the logo design, we brought the brand to life through extensive collateral design work, from business cards to letterhead files to tradeshow graphics to merchandise options. The brand design was then shown to important stakeholders + investors through a comprehensive presentation deck. 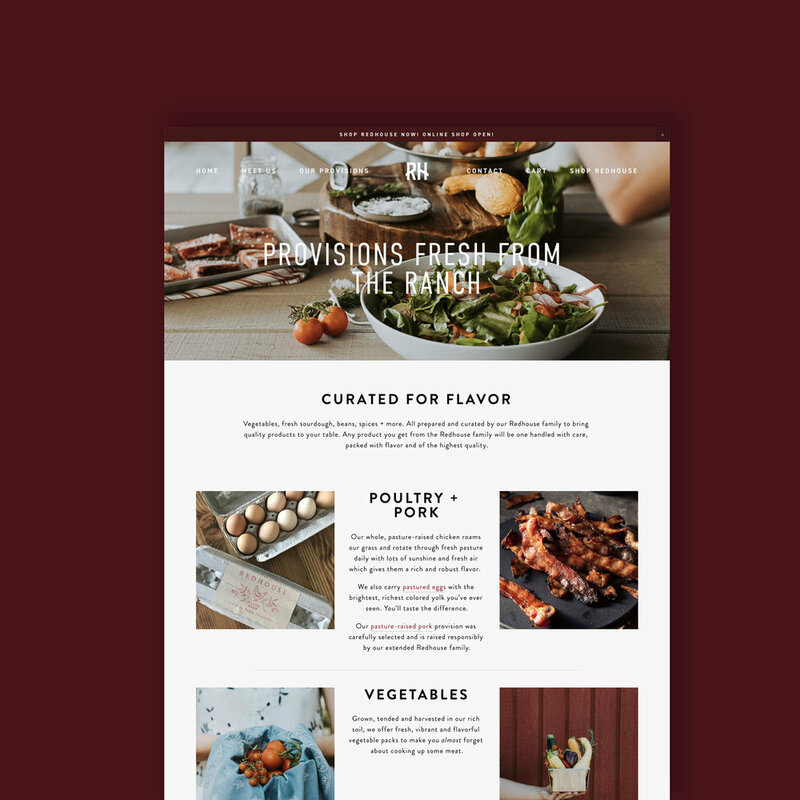 We worked with the business leaders to develop their brand story, the reason behind the brand name, graphics to illustrate their business model + a viewer-friendly outline to share. Part of Arable’s process is to share exciting events with the press, and the formation of Laurel was no exception. Along with their team, we helped capture the essence of Laurel and its service + purpose in a concise and informative press release. As they continue to acquire and develop, we are excited to help them write and share this exciting news. From where we started to where Laurel is today, the transformation is huge. 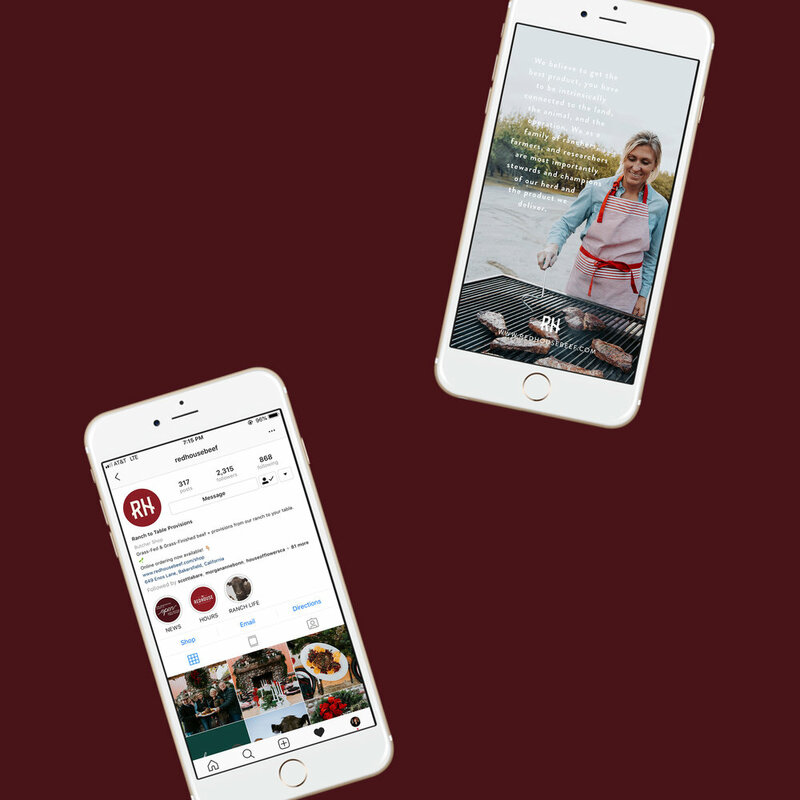 The acquisition is now formalized through a new identity—one that each of the individual businesses feels connected with and can own as they hand out their new business cards. We are proud to have helped Laurel shape those broad ideas and form them into a brand with a story, purpose + drive to succeed. We are honored to be the creative partner to Laurel. Brandwell is a game-changing brand workshop for you and your business. Late one afternoon in 2017, a few of us gathered to discuss the state of branding in Bakersfield. Unfortunately, the state was sad—void of a voice and lacking a social media presence. We decided together that it wasn’t ok to go into 2018 this way, so we developed a workshop to help small businesses brand themselves, clean up their image and leverage social media to move their businesses forward in a sustainable way. Alongside Oleander + Palm and our favorite photographers, Lex & Ev and Rubi Z Photo, we brought Brandwell Workshops to life in a city that never really talked about branding before. We found that businesses in our city didn’t understand the importance of branding themselves or what branding even means. Throw up a graphic, open doors, post on social media every once in a while—that’ll do it! 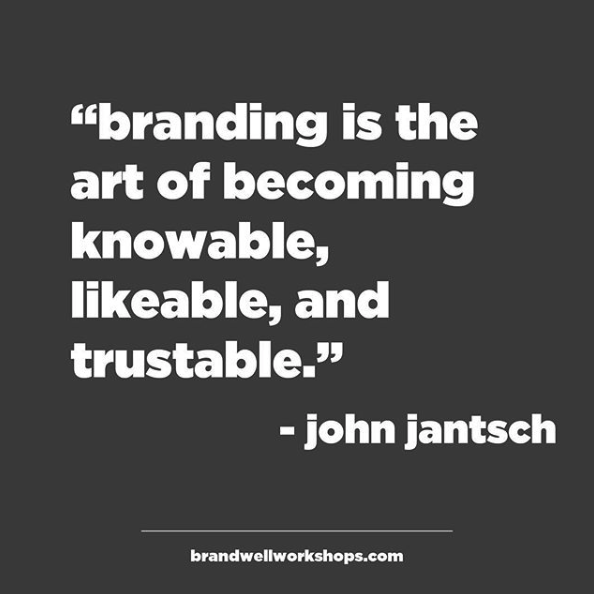 Through Brandwell Workshops, we wanted to share that to have a brand, you need to build it with a strategic base that all decisions run through. We felt that the best way to share our insight would be to start a social media presence that would inspire + teach while showing a well branded execution. We also offered in-person opportunities to develop these skills. To get started, community came first. We wanted to share our passion, insight + latest tips in an easy-to-engage way. We set up Brandwell Meet Ups where we focused on brand-related activities like taking photos on an iPhone or how to plan content calendars for social media. We also set up times to bring in experts that all business owners need in their back pockets, including professionals from fields like insurance, accounting + law. Our first workshop was in January 2018. Attendees represented business from several industries, including weddings, real estate, interior design, photography, nutrition + coaching. Our May 2018 workshop featured much the same but added in some local flavor with a group of talented musicians. Read more about the Brandwell Alumni here. Our philosophy + structure was drilled down to eight components, spread into two days of intense workshop time. Capture your ideal aesthetic based on your brand strategy through moodboards + color. Create or refine the first impression customers get from your business—your logo, your brand colors + your visual point of view. What's your brands style? Learn how to find style while on the go that represents your brand aesthetic. Learn what props, colors + vibes meld best with your brand. Have a branded photoshoot to capture your newly refined brand through the use of expert stylists + photographers. Learn how to take and edit stunning photos on your own, in a simple way that fits into your busy life. Create a plan for your content + brand building activities so you can get back to the actual work! Create a plan of action to implement + announce your brand through social media, your website + traditional personal marketing. Take your business to the next level and learn tactics for business growth, scaling + collaboration. 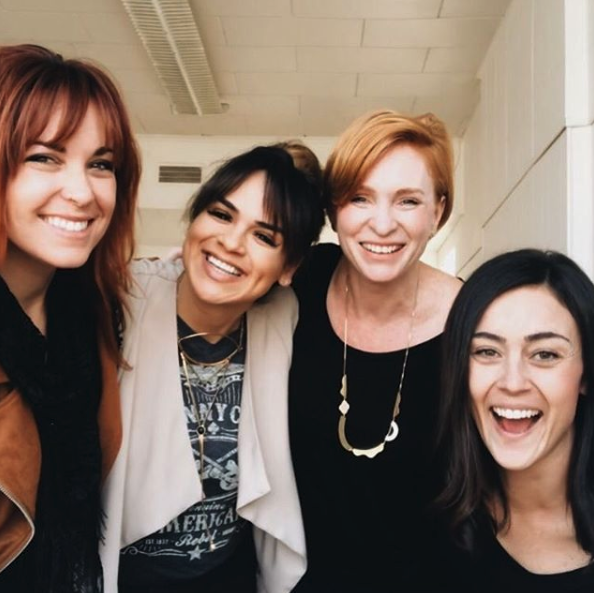 Connect with likeminded entrepreneurs for camaraderie + support! To those that attended + implemented the principles, design, style + strategy, the change is magnificent. We are honored that so many have joined with Brandwell to make their brands a way to share their story + vision in a clear way. A bit about us was featured in the Bakersfield Californian. Read it here. Operating this type of workshop in Bakersfield has been hard, though. Our city doesn’t speak the brand language yet, and the budding entrepreneur is still finding its safe haven here. We are hopeful that Brandwell will expand in the future to other cities, online courses, community-building + even more workshops in our hometown.